TAOISEACH ENDA KENNY was subjected to angry protesters on a visit to Athlone yesterday with one accusing him of forcing his children to emigrate. In another confrontation, Kenny told a protester: “You could do with a day’s work, I’d say” when told to “take the bridge, head west and stay there” amid acrimonious scenes on a visit to the Golden Island Shopping Centre in the Westmeath town. A man identified in today’s Irish Times as Peadar Doyle confronted Kenny as he arrived at the shopping centre during canvassing for a Yes vote in the upcoming Fiscal Compact referendum. The Westmeath Independent provides a full transcript of the brief exchange. 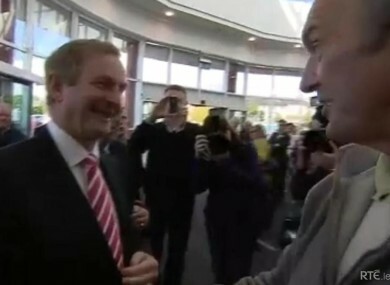 Email “Video, audio: Kenny tells protester 'You could do with a day's work, I'd say'”. Feedback on “Video, audio: Kenny tells protester 'You could do with a day's work, I'd say'”.